The sides of car #3280 are plain in design and could be fairly uncomplicated to model with layers of styrene. A B&M mechanical department document indicates each car side of #3280 has 2 door openings that are 8' wide. An enlargement below of the car circled in the opening photo of part 1 shows that this car has 2 sliding wood construction doors per opening. 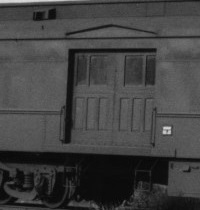 The above photo also shows this car had reinforcement plates under each door opening, a belt rail and what appears to be a batten strip separating the letterboard area from the lower part of the sides. 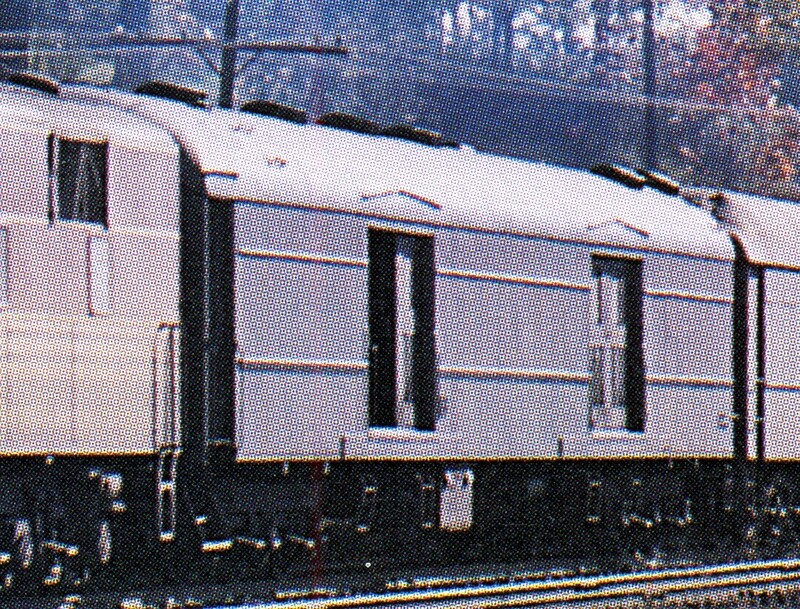 It is my understanding that it was standard B&M practice on all converted baggage/express cars that each baggage door had one window large enough for a person to egress in an emergency. The photo below of a B&M converted Pullman clearly shows the one window large enough for that purpose per door, this is the wooden door design that will be used on the model. Above are the known and photo evidence details of B&M #3280 car sides. What is not known for modeling is the placement of the baggage door openings and any rivet pattern on the car sides. The 20' to center door opening placement in the drawing below is only conjecture but this measurement looks like it could be near to correct and will be used on the model. The sides will be modeled with a four layer styrene system used on other rolling stock previously built for the layout. The photo below shows the first 2 layers. The base/1st layer is .010" thick styrene cut to the length and height dimensions required for the sides. A strip of .060" 1/4 round strip styrene is glued to one end only of each base layer for modeling the car corner posts, an existing vestibule door jamb will frame the opposite ends when mounted to the Branchline core. The 2nd layer is also .010" thick. This layer covers the base layer and will form the exterior surface of the doors that will be visible on the finished model. All other areas of the base layer will also be covered with .010" filler pieces that will be unseen on the finished model after the 3rd layer is applied over them. A .025" slot will be left open under each door, this will be for a .020" thick door sill to be mounted later. There is more on this blog about layering and how the doors were modeled using styrene strips and jigs, this method was also used when the RPO cars were built and can be seen there. Below are a sample of the many parts that comprise a door, these are just the vertical pieces that will be used when assembling the doors on the second car side. The 3rd layer will represent to outer surface sheets of the sides, these side sheets are all .040" thick. Each side sheet has 3 basic parts, the upper side sheet, lower side sheet and a .015 x .060 upper belt rail piece. The .060" wide surface of the upper belt rail piece will be glued sandwiched between the upper and lower sheets, leaving .015" x .020" protruding further out from the side sheets to represent the top of the belt rail. The .010" thick batten strip and lower belt rail piece are actually parts of the 4th layer of detail. The lower belt rail piece will be glued directly under the upper belt rail piece completing the belt rail and the batten glued were needed. One of the six completed side sheets is at the top in the below photo. Below are both finished sides. Pieces of .040" thick strip styrene fill in between the side sheets above and below each door and .040" 1/4 round strips make up the door jambs to complete the 3rd layer. The 4th layer door opening reinforcement plates are in place under each door, these are also .010" thick. The door sills will be added later before painting. The windows openings will be cut out and mounting holes will be drilled for all hand grabs before the sides are attached to the Branchline core. Not having photographic proof of the rivet pattern on the prototype, a generic rivet pattern was applied with Archer rivet decals. Next time will finish the car ends and roof. Thank you for sharing your work on modeling the Danbury Rail Yard. I grew up in Danbury in the late 70's, 80's and early 90's right around the corner from the old Union Station, now the Danbury Railroad Museum. I remember the old Meeker's Hardware, the yellow and brown Union Station with it's curved eves, the turntable, and the giant metal gas ball (link to photo below). I have fond memories of going on train rides and being allowed to stand on the back railing of the last car as the rail yard passed before my eyes. My Grandfather grew up in Danbury and told me stories of hopping on the back of trains to help get home from school quicker. My favorite story was of him running to catch the train and just as he grabbed hold and pulled himself aboard, his clarinet case opened spilling the instrument into the Still River. He always told that story with a twinkle in his eye! When my son was young and excited about trains, we would go to model railroad shows all around the state. I began building my own modules but my son's interest waned before I made significant progress. I recently took out my model railroad supplies and thought it might be fun to spend some more time working on it. I too would like to model the Danbury Train Yard as it is such an important part of my childhood memories. My skills are no where near the level I have seen on your blog or in Model Railroader publications, but I am sure the information you have shared will help me to be far more successful. Your model railroad work is fascinating. The depth of your research, skill in modeling, and incredible artistry is astounding. I would love to see more photos or video of your layout and perhaps discuss how you went about modeling aspects of your layout. Please feel free to shoot me an email when you have a moment. My email address is AlanofSmith@gmail.com I look forward to all that you will continue to share in your Signal Station 199 blog.